Yes, you are reading that correctly. I found a recipe for Spinach and Artichoke Pasta, and it was simply divine. You guys might have noticed that I haven’t been adding new posts about cooking. It’s because I have been reverting to some old favorites like the Penne Rosa and Melt in Your Mouth chicken recipes. However, for this recipe, it takes a little more work than the previous recipes on here, but it’s one hundred percent worth it! If you are a fan of the dip, then this is definitely a future dinner for you. Here is where I found the recipe. 1. Melt 2 tablespoons butter in a large pot or skillet. Add garlic as well as the spinach. Keep in there until spinach starts to wilt. Then, remove spinach from heat and set aside. 2. Add 2 tablespoons butter to the same pot. Throw in the halved artichokes and stir it around until they get a little color. Remove the artichokes from the pot and set them aside. 3. Reduce the heat to low. Add 2 tablespoons butter to the pot. 5. Add milk whisk to combine. Let it set for a few minutes so that it will start to thicken. 6. Add Parmesan, Mozzarella/Monterey Jack, salt and pepper, and cayenne pepper. Stir to melt, and if it’s overly thick, splash in chicken broth. 7. Add artichokes and pasta, tossing gently to combine. Gently fold in spinach, then pour the pasta into a serving bowl. Sprinkle the top with crushed red pepper flakes and plenty of Panko breadcrumbs for crunch. I had some trouble cooking this. My problem was that it was too thin and not thick enough. I added some cream cheese and it helped it out. Even though I had a little difficulties cooking it, it was one of the best things I have had recently. I’m counting this as a win! No Prob! I’m glad you are going to give it a shot! 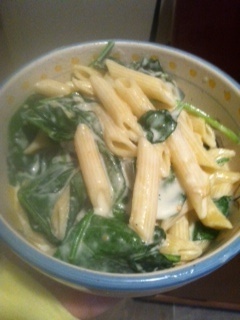 Three of my favorite things….Spinach, Artichoke, and Pasta. I am looking forward to it.